As part of Asia week Year 1 and 2 children have taken part in a mini Olympics. On our school field the children had a go at Sprinting, Hurdles and Discus. Afterwards the children looked at the Beijing Olympics website - click on the logo below. 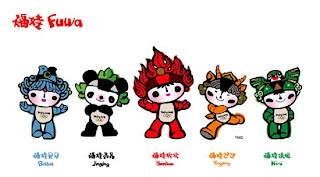 We particularly looked at the Olympic mascots (5 different pandas) and the symbols used for the various sports. The children then had a go at making their own Olympic rings and sport symbols using a drawing program called 'Revelation Natural Art'.